Not long ago, virtual reality was the stuff of science fiction - but soon it will be the way that engineering students learn their craft. 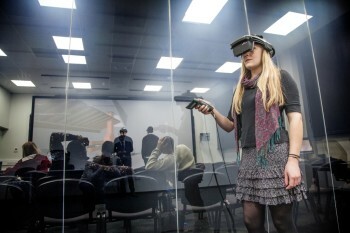 A virtual reality (VR) suite, comprised of a VR auditorium and a head-mounted display (HMD) suite, has been installed at the London South Bank University (LSBU). The suite will teach budding engineers to examine complex problems and develop creative solutions. The main feature of the suite is the auditorium and its 6 m x 3.2 m (19.6” x 10.5”) ActiveWall screen. The screen provides an immersive 3D visualization projected at a 1:1 scale to give large projects a sense of realism. The second feature of the VR suite comprises an ActiveSpace HMD suite. This space is large enough to accommodate physical equipment, which can be hooked up with sensors or transducers to enhance the virtual experience. The HMD suite is separated from the auditorium with an electrostatic wall, which users can turn opaque with a switch to alternate between collaborative and independent projects. Both components of the VR suite incorporate wireless tracking and navigation to monitor motion and create an interactive experience for users. The system uses four avatars so students can interact collaboratively and in real time. 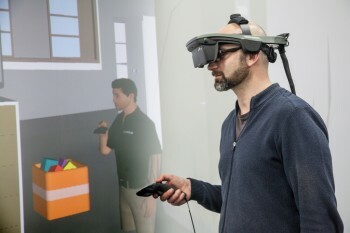 The VR suite at LSBU, designed by Virtalis, will enable students to explore the fit and functionality of their designs and potential modifications to improve effective operation. It will work in conjunction with the school’s Project-Based Learning Lab, a CAD suite with 23 workstations running various software programs from Autodesk, Ansys and Siemens. This lab also facilitates rapid prototyping and physical prototyping using Stratasys 3D printing technology. The combination of the VR auditorium and the HMD suite is intended to help users understand the use of VR in a range of engineering disciplines including mechanical, electrical and chemical. For more information about the virtual reality suite, please visit the London South Bank University and Virtalis websites.